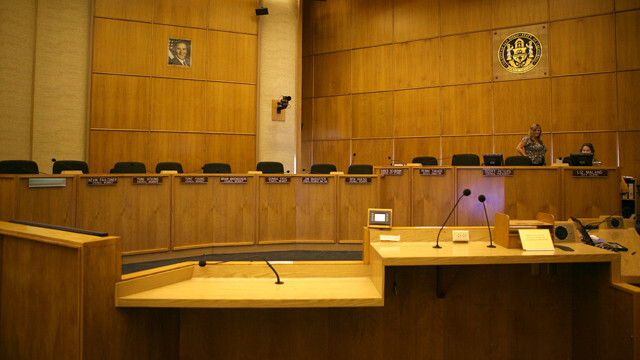 San Diego City Council chambers. Credit: Wikimedia Commons. Sixteen people kneeled for the Pledge of Allegiance at the start of the San Diego City Council meeting Tuesday, to demonstrate support for former NFL quarterback Colin Kaepernick, suspended ESPN anchor Jemele Hill and a local man they contend was a victim of racial profiling. The protest was peaceful and didn’t elicit immediate comment from the council members or audience. “You look around the country at the racial divide, it’s a huge issue,” the Rev. Shane Harris of the San Diego chapter of the National Action Network told reporters after the short protest. Kaepernick, most recently a member of the San Francisco 49ers, stirred controversy last year when he began taking a knee during the national anthem to protest racial injustice. Other National Football League players began following suit as the 2016 season went on, and some continued the protests this season. Opponents of the tactic consider it disrespectful to the country and the flag. President Donald Trump and Vice President Mike Pence have been harshly critical of the protesters, and Dallas Cowboys owner Jerry Jones said Sunday that those who disrespect the flag shouldn’t play. ESPN suspended Hill for two weeks after she tweeted remarks regarding Jones. Harris said his San Diego group also aimed to support Raymond Wiley, a 67-year-old man who has filed a claim against the city for an arrest he said was racially motivated. Wiley told reporters that he was arrested on suspicion of carrying a leaded pipe and burglary during his regular morning walk in July. He said the officer mistook his walking stick for a weapon, and accused him of casing vehicles. He said he spent nearly 24 hours behind bars but was never actually charged, only to discover the officer who arrested him changed his story about the circumstances. “We’re here to deal with racial profiling today on a national level, but to bring it back to a local level with what happened to Mr. Wiley and continue to shine light upon his case,” Harris said. The Risk Management Department will decide whether or not to accept Wiley’s claim. He said he might file a lawsuit if his claim is rejected.